I probably went on the farthest bike ride ever today. I bike rode from my location ofBurlington, NJ all the way to Hammonton, which is a solid 35 miles. I first stopped atRadio Shack to return my mini-A to USB line for my cell phone because I already bought a converter for it. I bought both just in case the converter didn’t fit. I saved about $30 because I had a mini-USB line already, but it was a mini-B so I needed a converter. Once I got to Hammonton, which was 3 hours later, I stopped into McDonalds to get a Sweet Tea because I ran out of my 2 waters. It was about 85 degrees out, and it’s a good thing it wasn’t any hotter, otherwise I would have never made it. 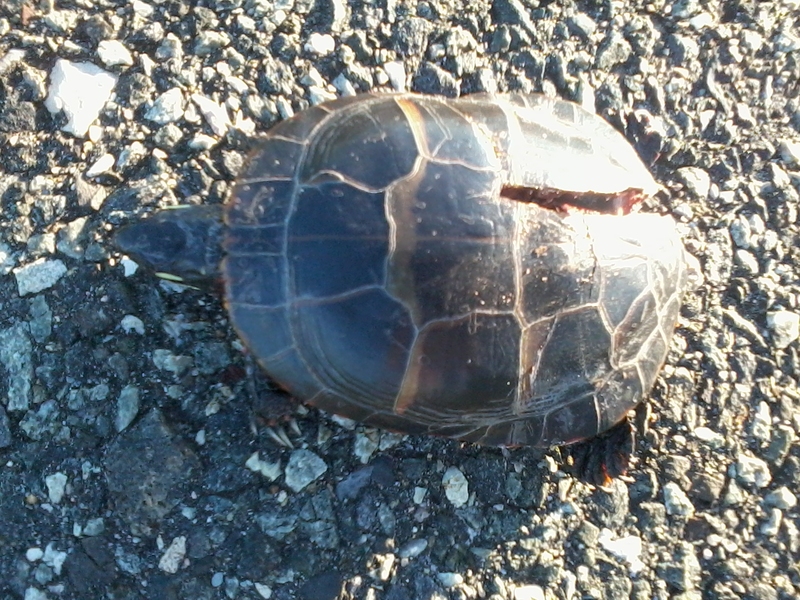 After I left Hammonton I saw a small turtle on the side of the road. I took a look at at and I found out that it was dead after I saw a crack in the bottom right half of the shell. I think a car ran over it. However, this seems unusual because the tread of the tire should have made 2 cracks in it if that was the case. It could be possible that another animal attacked it. Here’s a picture that shows it. I also saw a European Starling on a telephone wire about 5 minutes later, but as soon as a turned my cell phone on and even before I turned around, it flew away. I also saw a Turkey Buzzard on a pole about 30 minutes later but I didn’t feel like taking a picture of that. I just feel uninterested in those kinds of birds. I have seen those birds even in my grandparents’ backyard. They are almost everywhere where they live. Well, overall, I had a good bike ride, but it got too dark and I had to have my mom pick me up once I got 3 miles from my house. I would like to say, out of all the birds I heard, I never heard any House Sparrow chirps until I got to downtown Hammonton. Dang, it seems like I can never find any in rural areas. Actually, there was one at a farm just outside of Hammonton, but that’s only because it relies on the livestock feed to survive. Whether urban or rural , it only occurs to me that they simply nest in our man-made structures, and that provides the warmth they need, especially when the winters are brutal. What’s the farthest bike ride you’ve ever gone? I can’t suppose anybody has traveled more than 70 miles like I had. Let me know.